(rollover to compare) How Is It Treated? If too much blood is pumped to the lungs with Double Outlet Right Ventricle, medications may be used to reduce the symptoms of heart failure and surgery may be performed to limit blood flow to the lungs (pulmonary artery banding). 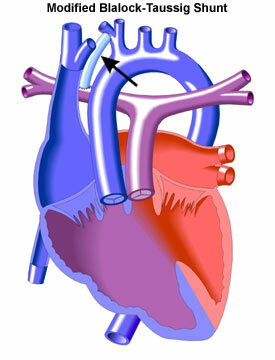 In cases where not enough blood is pumped to the lungs, a Modified Blalock-Taussig Shunt (Gore-Tex® tube) may be surgically inserted between the aorta or one of its branches and the pulmonary artery (see illustration at left). This increases blood flow to the lungs and decreases the infant's blueness. In some cases, open-heart surgery will be performed (the Rastelli Operation) to close the VSD (see Ventricular Septal Defect) which would channel blood flow from the left ventricle to the aorta, separating the heart-to-lungs and heart-to-body circulations. A conduit connecting the right ventricle to the pulmonary artery completes the repair. In cases of double outlet right ventricle where either the right or left ventricle is hypoplastic (very small), or when the VSD cannot be committed to the aorta, the surgical approach is the sequence of single ventricle surgeries culminating in the Fontan Operation.